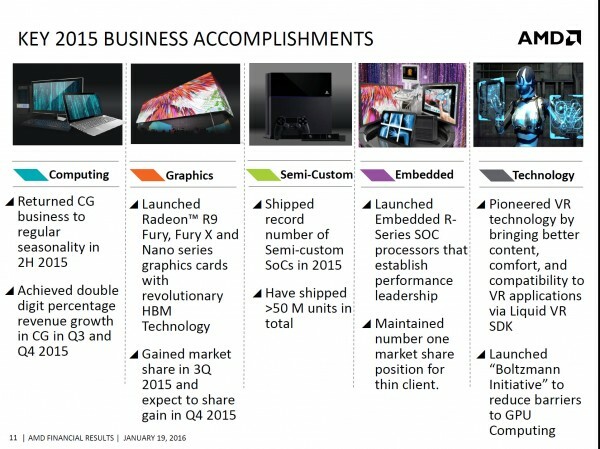 AMD has announced its fourth quarter and full year financial results for 2015, and it seems that the PC market decline affected the company quite a lot. According to AMD, it ended 2015 with “solid execution” which was reflected with its “double-digit percentage revenue growth” for two straight quarters in 2015. However, it still wasn’t a very good year for AMD. In the fourth quarter of 2015, AMD’s revenue was at US$958 million (about RM4.2 billion) with an operating loss of US$49 million (around RM215 million) and net losses of US$102 million (approximately RM450 million). This translates to a net loss of US$0.13 (about RM 0.60) per share. However, cash and cash equivalents increased by US$30 million (around RM130 million) when compared against Q3 2015. 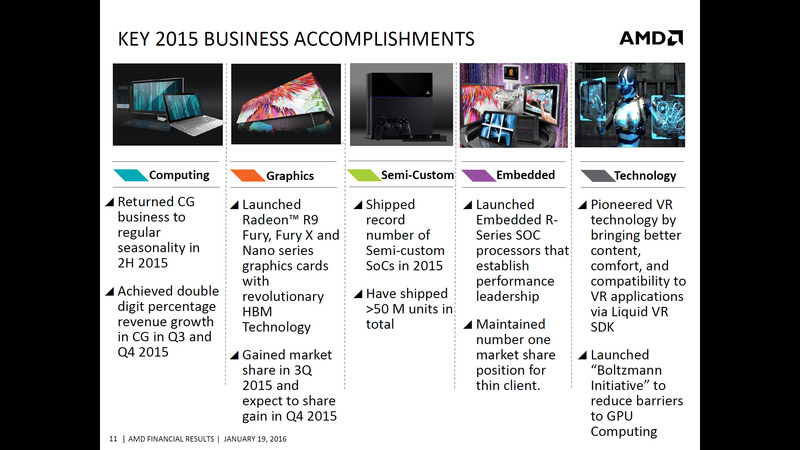 AMD’s financial results for the whole of 2015 doesn’t get better either. Revenue was recorded to be at US$3.99 billion (about RM17.55 billion), which is 28% lower when compared year-on-year. AMD says low client processor sales contributed to the decline. In addition to that, operating loss was recorded at US$481 million (around RM2.1 billion); pro-forma operating loss were US$253 million (approximately RM1.1 billion). When compared year-on-year, the operating loss for 2015 rose about 32.2%. AMD faced a net loss of US$660 million (about RM2.9 billion) in 2015 and losses per share of US$0.84 (about RM3.70). Pro-forma losses were US$419 (around RM1,840) along with losses per share of US$0.54 (approximately 2.40). Unfortunately, if compared year-on-year, AMD’s net losses increased by 61.1%. 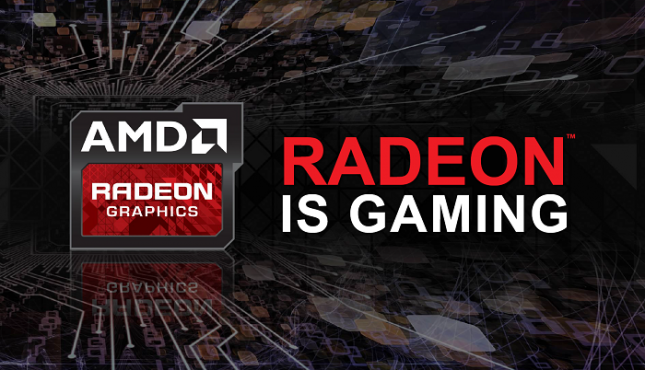 AMD’s CEO and President, Lisa Su, mentioned that although 2015 was a challenging year from a financial point of view, the introduction of new products by AMD and Radeon would, hopefully, improve their financial results in 2016.